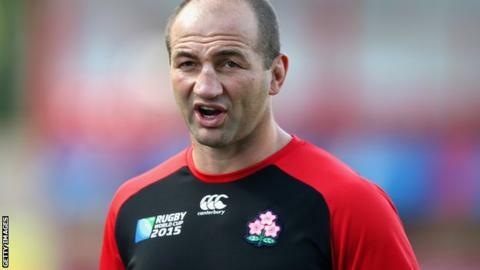 Bristol director of rugby Andy Robinson says the club have been hit hard by the departure of forwards coach Steve Borthwick, who he believes will be successful with England. Borthwick, 36, left his role at the Championship side after only 43 days. The former England captain arrived at Bristol several weeks into the season having helped Eddie Jones coach Japan. "It's kicked us quite hard because this has been about planning and waiting for Steve to arrive," said Robinson. Borthwick was named forwards coach with Jones' new-look England in acrimonious circumstances last week, with Bristol owner Steve Lansdown describing the Rugby Football Union as "unprofessional" in their handling of the appointment. Robinson was forwards coach during England's World Cup-winning era under Sir Clive Woodward before taking over as England head coach himself from 2004-06. And, while he is unimpressed by the manner of Borthwick's exit, he is certain England have made an astute appointment. "I was delighted to have signed Steve and I certainly hoped he would be here for longer than 43 days," Robinson told BBC Radio Bristol. "He is a quality coach and he will be a quality coach for England and I wish him all the best. I know the England team will enjoy working with him. "I'm disappointed in the circumstance of how it's happened and why it's happened but legally I can't say too much and we have to move forward." Robinson, who has also coached Scotland, says he will not rush into appointing a replacement and has urged his forwards to handle the responsibility of Borthwick's departure. "It's down to the players to step up collectively over the next four months for us to achieve what we want to achieve," he said. "We have to focus on the next couple of weeks, with tough games coming up against London Welsh and Nottingham. There is a lot to be done over the next few weeks."